The venue for the Ninth International Art Competition will be in the LDS Conference Center in Salt Lake City, UT. The exhibit officially opens the evening of March 16, 2012 and runs through October 14, 2012. The complete gallery of juried entries will be on the Church History Museum website beginning March 21, 2009. Three days later just as the last rays of the sun were streaking across the sky, she saw the glimmer of the bright red shawl in the distance. In the depth of their tribulation, a tender mercy had been extended by a loving Heavenly Father. Inspired by the story “The Lost Boy” related by Boyd K. Packer from pioneer journals. 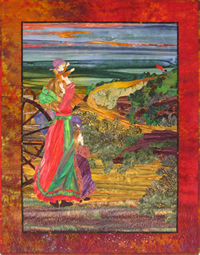 An Original Quilted Fiber Art Landscape created in appliqué technique with hand dyed, over- dyed and batik fabrics.